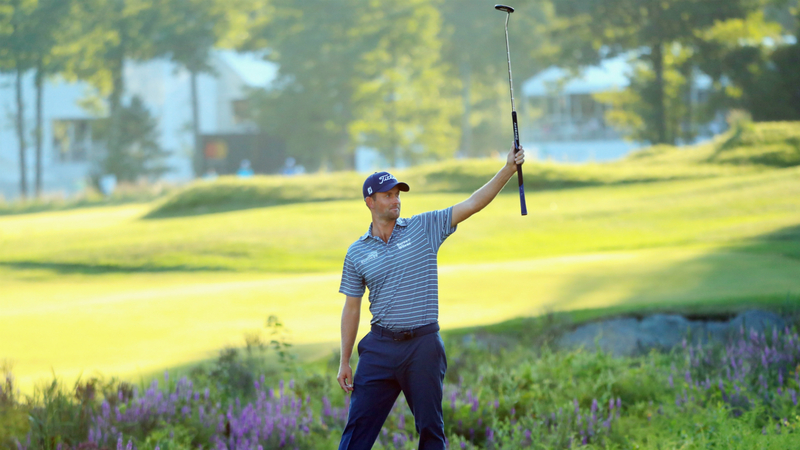 Webb Simpson surged into a one-stroke lead at the Dell Technologies Championship after his flawless second round in Boston. American and five-time PGA Tour winner Simpson dazzled at TPC Boston, where the 2011 champion carded a bogey-free 8-under 63 on Saturday. Projected to rise to the top of the FedEx Cup standings as things stand, Simpson, who entered the second playoff tournament ranked ninth, rolled in an eagle from 70 feet off the 18th green to take the lead. Simpson, winner of The Players Championship in May, finished with six birdies and an eagle to be the man to beat at the halfway stage of the event. [email protected] puts an exclamation point on the round. Tyrrell Hatton and fellow Englishman Justin Rose are a shot off the pace heading into day three. Hatton posted eight birdies with a store-bought putter for a 63, while overnight leader Rose lost top spot following his 4-under 67. Another Englishman, Tommy Fleetwood, produced a second-round 65 to be outright fourth at 8 under. Former world No. 1 and 2015 FedEx Cup champion Jordan Spieth produced another solid round, this time shooting a 4-under 67. After a slow start on his front nine, Spieth birdied five of his first seven holes following the turn to be five strokes behind Simpson, alongside the likes of Xander Schauffele (68) and Marc Leishman (68). Dustin Johnson is a shot further back after his 69, with the world No. 1 projected to drop down to third in the FedEx Cup standings. Three-time major champion and in-form PGA Championship winner Brooks Koepka is four under after back-to-back 69s. It was a mixed day for Koepka, who had an eagle, three birdies and as many bogeys to be level with the likes of Tiger Woods, Bryson DeChambeau and Rory McIlroy. After opening with a 72, 14-time major winner Woods recorded a blemish-free 66 to remain in the picture, FedEx Cup leader DeChambeau produced a 68, while Northern Irish star McIlroy signed off on a 67.